When it comes to buying cars, you should always have your guard up when working with dealerships. But believe it or not, they aren’t all out to rip you off. And you can get a really good idea on the type of operation they run based on their ads. As a professional car shopper, I’ve brokered hundreds of car deals and worked with stores all over the country. I’ve noticed a pattern: if a dealer is advertising with either a sale price or a lease offer way below what you would normally expect, chances are good that this store is a place that will be difficult to work with in terms of getting a straight answer. For example, the ad above came across my email from a dealership in Florida (I’m sure all of you are shocked by that development.) 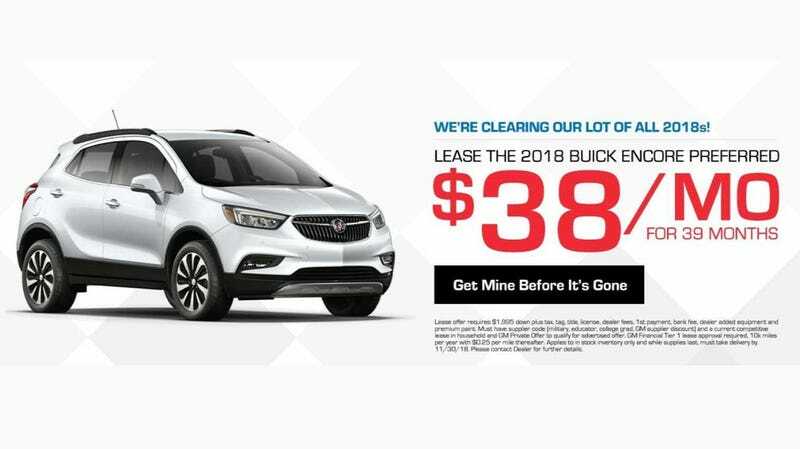 This particular Buick store is advertising an Encore lease for less than what some people pay for their cell phone. Just $38 a month! How is that possible? Generally speaking, I recommend that buyers assume that any advertised lease deal whether it comes from the automaker or a dealer be approached with a big grain of salt, as those ads are rarely reflective of reality, but I had to learn more about this insane deal. In addition to the fairly standard downpayment, once all the taxes, fees, equipment, and paint charge (?) are added in, the number of caveats and requirements to get this discount is incredible. What this is called is “rebate stacking,” and it is common and totally legal as long as it is disclosed. The dealers are well aware that almost no one would qualify for every single one of those programs, and therefore the actual payment on that Encore will be much higher than the ad. There is a clear objective for an ad like this, and the analogy is that this is a fishing hook with bait on it. Dealers will often push out these super cheap prices and payments for the sole purpose of getting someone in the door. They are banking on someone to see those numbers and get excited “Oh man, I can afford that!” and make their way to their local dealership. That is when the “How much do you want to pay per month?” and “I gotta talk to the manager” games start. The target of an ad like this is an uninformed buyer, exactly the type of customer this dealer wants. I’ve dealt with numerous stores who are just terrible at this whole “internet sales” thing and stores like this are far more likely to refuse to send a detailed quote or respond to questions via email. These stores are usually worse than the places that use the “call for price” tactic. If you are seeing a price that looks too good to be true, it probably is. And that dealer is most likely not even interested in dealing with a buyer who’s going to ask the right questions and demand the details.